Sarita loved this book, which is full of testimonies to the transformational power of sound. The mantras in this case invoke many different aspects of the divine feminine. Recently I was gifted a very special pocket sized book which holds keys to transform each and every aspect of one’s life. The author has been working with Shakti mantras for the past 40 years. He offers a wealth of compelling evidence in how and why Mantras work as well as they do for dissolving negative karma and opening up more potential for fulfilment in each and every aspect of our lives. In essence, mantras work with the potent power of sound which used to be known in the past as a powerful science. This book offers many meaningful stories which to some may appear silly or cultish but in actual fact, these stories carry great wisdom teachings through parable. Our inner child absorbs the story and through this, we simultaneously absorb the deeper occult significance hidden in the story. This is similar in effect to the journey of the butterfly, who while searching nectar, unwittingly becomes the carrier of pollen, making the whole garden bloom. Through mantra chanting we are tapping into the pollen we need to help our garden of life manifest its full potential. Each mantra is explained through story, and then written in a way which is easy for us to follow. A mantra is in general practised for 40 days, twice a day for up to 1/2 hour at a time. We will begin to see results at the conclusion of our 40 days of recitation. 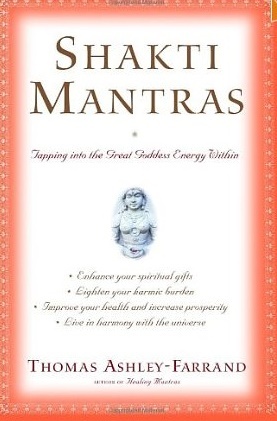 These mantras listed in the book are primarily offering access to the energy of the divine feminine as Shakti power par excellence. This book has now become my trusted friend. Perhaps it will be yours as well.